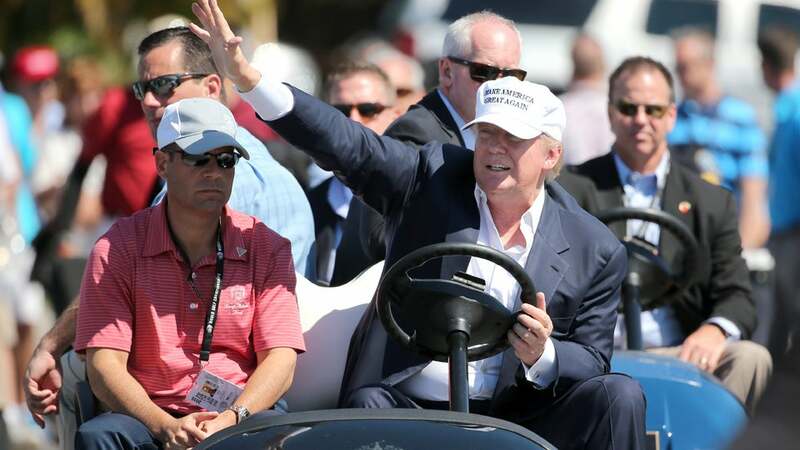 Republican presidential candidate Donald Trump makes an appearance during the final round of the World Golf Championships-Cadillac Championship at Trump National Doral on March 6, 2016, in Doral, Florida. The Republican race for the White House keeps circling back to golf. Both John Kasich and Donald Trump play, and Trump in particular has a habit of bringing up his prowess on the golf course -- whether it's his long-drive claims or boasting that he plays better than Obama. Various people have accused Trump of cheating on the links. Meanwhile, Kasich has been interviewed on the Golf Channel about his love for the sport and has been seen hitting the driving range in between campaign stops. This week, Trump leveled a new criticism at a rival candidate: Kasich watches the Golf Channel when he should be tuning into news. In an interview on CNN, Kasich said he doesn't watch much TV news. "I basically watch the Golf Channel when I’m traveling, believe it or not."